Pool tables are a recreational investment that should last for years to come, but after your pool table installation, caring for your pool table properly is essential to get the maximum life out of your new showpiece. Your San Jose pool table professionals can assist you in your pool table maintenance so that you can simply enjoy your new hobby. A pool table cover is an accessory that you may not feel like purchasing from your local pool table professionals, but you should consider buying one if you value the condition of your pool table. An uncovered pool table is susceptible to rips and tears, the collection of pet hair, and gradual fading from sunlight. Even a covered pool table will collect dirt, chalk, and hair. Depending on your preference, you can use low-powered handheld vacuums, cloth cleaners, or brushes to clean your pool table. The wooden components can be polished like other fine furniture, and any spills on the felt or wood should be cleaned immediately with a slightly damp cloth to prevent damage. Also, you don't want to forget to clean your game balls, which collect chalk and dust that are then dispersed across the felt. Consider cleaning your game balls with a microfiber cloth after every game. Sunlight affects everything it touches – your plants, your skin, and your pool table. If you decide to place your pool table next to a window, consider the cloth fading and bleaching that will occur from relentless rays of sun. Window films, blinds, and shutters are effective protectors of your pool table if you insist on playing in natural light. Table covers will also prevent the fading and bleaching of your pool table's surface. Consider hiring pool table professionals to diagnose your pool table's condition after the first year of ownership. During the checkup, the pool table mechanic will check for overall wear and tear and make sure that the pool table slate is level, the rubber cushions are fastened to the rails tightly, and the rail bolts are tight. Whether you play pool competitively or leisurely, you'll want your pool table to remain in excellent condition throughout its lifetime. 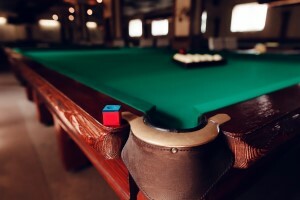 Make sure to care for your pool table properly, and don't forget to schedule a checkup with the San Jose pool table professionals, The Pool Table Pros. If you need help with your pool table, then please call our reliable San Jose pool table professionals at 408-499-6300 or complete our online request form.